This genealogy is imperfect yet remains a good first step for many of our researchers. The following pages list persons who settled in Scituate beginning in 1633, the date of the Town’s earliest records, together with their occupations, birthplaces and location of lands granted to them in Scituate, if known. Unnamed wives, children and servants are not included. While there may have been residents in our town prior to that year no good primary sources have been found. However, there is implied evidence that a settlement did exist before 1633. There are also families who arrived a generation later who went on to have enormous roles in the development of the Town and the country. No offense is meant by the inclusion or the exclusion of any family. The work continues and the sources emerge. Samuel Deane’s “History of Scituate, Massachusetts” published in 1831, includes sketches of many of our early families but should be used with caution. 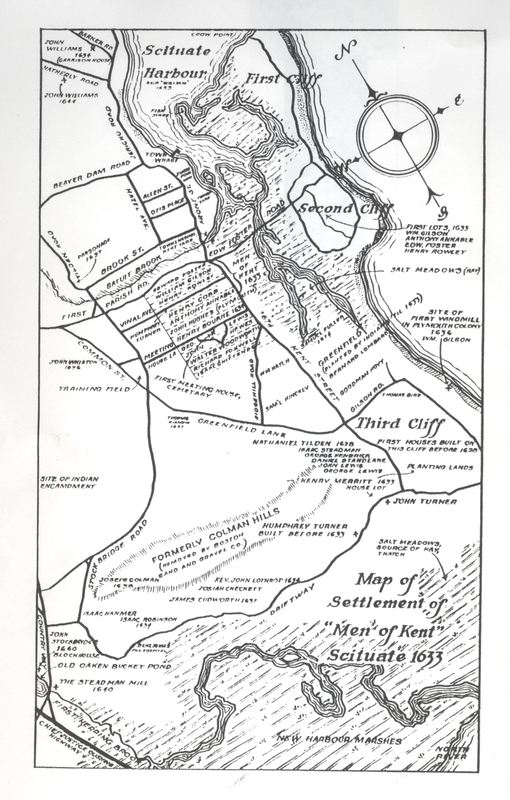 A map of settlement for the "Men of Kent" appears at the bottom of this page. SCITUATE: pronounced Sit-chew-it - accent on the first syllable. Common land: town 1633. Incorporated 1636. Hingham and Hull, set off from Suffolk County to Norfolk County, 1793, but on their protest restored to Suffolk in the same year, were added to Plymouth County in 1803. Both towns were originally part of the Massachusetts Bay Colony. Cohasset incorporated as a district from part of Hingham, 1770; town, 1775; elected to become a part of Norfolk County, 1793. Francis Bavers/Babers built his house, the thirty-seventh in Scituate, before October 1636. He is styled “Mr.” in Lothropp’s notes. His surname could possibly have been Bowers. Thomas Besbeech/Besbedge/Bisbetch/Bisby from Kent, England,and his daughters Mary and Alice were part of the Tilden group who came to Scituate on the ship Hercules in 1634/5. Thomas was a freeman in 1637 and deacon of the First Church in Scituate at its first institution. In early records he is styled as “Mr.” After 1639 he may have moved to Duxbury. Thomas Bird/Byrd was a freeman in 1633; according to the Lothropp notes he built the fortyeighth house by 1637. Thomas Boiden/Boyden was a servant to William Gilson; he joined the church in Scituate 17 May 1635 and was one of the members who remained after the Lothropp group left. He later removed to Watertown in the Bay Colony. Henry Bourne was a freeman by 1636/7. He acquired Richard Foxwell’s first house, which Lothrop called the 11th built “since my coming,” i.e., 27 September, 1634. It was on Kent Street, the fourth lot south of Meetinghouse Lane. Bourne removed to Barnstable in 1639. Priscilla Browne, “orphan” daughter of Mayflower passenger Peter Browne of Plymouth, was placed by the Plymouth Colony Court with William Gilson for 12 years in 1633. Thomas Chambers from Kent, England was the stepfather of John, Richard, Thomas, and William Curtis. Chambers owned land on Third Cliff and at the New Harbour marshes by 1639. Josias Checkett, styled “Mr.,” by Rev. John Lothropp, acquired land on the Driftway near First Herring Brook adjoining Lothropp’s farm. Thomas Chittenden/Chittingden, linen weaver; English birthplace unknown, married Rebecca Bamfort at Wouldham, Kent. Thomas, age 51, his wife Rebecca, age 40, and sons Isaac, age 10 and Henry, age 6, sailed from England on the ship Increase in 1635. As noted by Lothropp, Thomas built the thirteenth house - on Kent Street, the fifth lot south of Meeting House Lane. Henry Cobb, tavern keeper, was appointed deacon of the First Church in Scituate, 1635. Moved to Barnstable by Oct. 1639. His first Scituate house was located on a four acre lot to the north of Anthony Annable’s and was the seventh built according to the Lothropp notes. It was later acquired by Henry Rowley, then by Steven Vinal before 1639. Cobb also owned land on Second Cliff and 80 acres of upland and marsh on the North River, sold to Manasseth Kempton, 1640. Joseph Colman was allotted a farm on the Driftway near the hills which bear his name. John Crocker and his brother William Crocker were in Scituate by 1636 and moved to Barnstable, 1639. William owned marsh near the Third Cliff which he sold to Nathaniel Tilden in 1638; his deed included a “sufficient way of thirty foot broad from the heigh way near Greenfields’s stile unto the marsh...” (PCLR 1:103) Lothropp noted that “Brother Crockers junior” built the forty-fourth house in Scituate. John, oldest son of William, was born in Scituate 1 May 1637, baptized 11 Jun 1637. James Cudworth, salter, was baptized at Aller, Somerset and was a member of Lothropp’s Southwark congregation in England. Before September, 1634 he built a house north of the brook at the harbor which may have been used for church meetings until construction of the first meeting house was completed in November, 1636. He sold his harbor property to Thomas Ensign in 1642. Cudworth was in Barnstable, 1640, but was back in Scituate by 1646. In a letter to his stepfather Dr. John Stoughton, dated December, 1634, Cudworth wrote “but we are but few--not passinge 60 persons,” i.e., then living in Scituate. John Damon/Daman and his sister Hannah Damon were in Scituate by 1633; They were the nephew and niece of William Gilson and inherited his property. William Dauckings/Duckings/Dorkins - Lothrop listed him as living in the twenty-second house built by George Lewis, Jr. He is styled “Mr.” in the Lothropp notes. Dauckings owned land on Third Cliff by 1635. Edmund Edenden/Eddenden is listed in the Lothropp records as building the fifty-third house about 1637; he was a freeman by 1641 and later was appointed to the Committee of Assistants to the Plymouth Court. John Emerson, planter, and Barbara Lothropp, daughter of Rev. John Lothropp, were married in Duxbury by Capt. Miles Standish 18 July 1638. Emerson built the forty-fifth house in Scituate which was possibly on Third Cliff as he sold land there to Nathaniel Tilden in 1639. (PCLR 1:102) The Emersons were among the group who went to Barnstable. Henry Ewell , shoemaker was a passenger with Nathaniel Tilden on the ship Hercules in 1634/5. Ewell and Sarah Annable, daughter of Anthony Annable, were married at Green’s Harbor [Marshfield], Nov 1638. Lothropp noted that Henry Ewell built the forty-first house, later bought by “Goodman” [Henry] Merritt. Ewell was in Barnstable, 1639. but later returned to Scituate. Edward Fitzrandolph, from Nottinghamshire, England, arrived in Boston 1630, married Elizabeth Blossom in Scituate 10 May 1637; he was a freeman by 1636/7, removed to Barnstable, 1639. He built the 38th house which later was acquired by Richard Sealis. Fitzrandolph was styled “young Master Fittsrandolf” by Lothropp. Edward Foster and Lettice Hanford, niece of Timothy Hatherly, were married at James Cudworth’s house by Miles Standish in 1635. Foster was among those who were dismissed from the Church at Plymouth in 1634 and was granted the first lot south of the stony (Satuit) brook, bounded by the highway on the east. His house is listed as the ninth, built about 1633/34. He also owned land on Second Cliff and at First Herring Brook. He died early; his widow later married Edward Jenkins. Richard Foxwell, tailor, was dismissed from the church in Plymouth in 1634, with Henry Cobb, Edward Foster and others “in case they join in a body at Scituate.” Lothropp noted that Foxwell built two houses in Scituate: the eleventh, on land allotted to him 16 Oct 1634 which was later acquired by Henry Bourne, and the fiftieth, built by 1639. Foxwell’s first house was the fourth lot south of Meeting House Lane, bounding on the highway to the east, on the north by Walter Woodworth. Foxwell removed to Barnstable, 1639. Samuel Fuller, freeman in Scituate, 1634, was in Barnstable by 1 Aug 1641 where his daughter Sarah was baptized. He and Jane Lothropp, daughter of Rev. John Lothropp, were married at Mr. Cudworth’s house in Scituate on 8 April 1635 by Captain Miles Standish. On that same day Samuel was granted a four acre lot, the first lot on the north side of the Green Field, bounded by Barnard Lombard’s lot on the south. William Gilson was granted land on 12th April 1633 and built the third house in Scituate according to the Lothropp notes. His house lot was located on Kent Street, the second lot south of stony (Satuit) brook. Gilson also owned land on Second and Third Cliffs and built a windmill on the latter, possibly the first in the Plymouth Colony. William Gilson died 1 Feb 1639. Elizabeth Hammond, daughter of William Hammond of Watertown in the Bay Colony, was described as his “sister” by Rev. John Lothropp. She married Lothropp’s brother-in-law Samuel House in Scituate about April, 1636. Eglin (Hatherly) Hanford/Handford, widow, born in Devonshire, was Timothy Hatherly’s sister. She was 46 years of age when she left London for New England 10 Apr 1635 with two of her daughters - Margaret Hanford, age 16 and Elizabeth Hanford, 14. Hatherly’s deed to Eglin dated 24 Feb 1640 reads “This land [five acres] was given to Egline Hanford the xxvith day of Septembr in the yeare AD1634.” The description continues: “bounded on the east end by the common path that runneth from the brooke to the harbours mouth... on the north by Gowin White; on the west with a common drift path or lane that runneth almost north and south... on the south by land of Richard Sealis.” (PCLR 1:71) Hatherly described it as the third lot north of the stony brook. Eglin Hanford married Richard Sealis in 1637. Thomas Hanford/Handford, son of Eglin (Hatherly) Hanford/Handford. No further record in Scituate. John Hanmer was in Scituate, 1639; built the 47th house on “the Cliffe.” In 1648 he sold marsh and upland on Third Cliff to Joseph Tilden. Ann Hanmer released her dower rights. (PCLR 1:168). Jane Harris/Harrice may have been a member of John Lothropp’s congregation in Southwark, Surrey, England. She joined the Scituate church on 21 Jun 1635. William Hatch, merchant of Kent, England, was a freeman by 1635 and later was ruling elder of the second church, now First Parish in Norwell. In 1634/5 he and his wife Jane, their five children and six servants were passengers on the ship Hercules with Nathaniel Tilden and others. On 12 June 1635, Hatch was granted a five acre lot on the south side of Greenfield Lane “buting with east end upon the way called Kente streeate.” It was bounded on the north by Greenfield Lane, on the south by Samuel Hinckley’s lot. Thomas Hatch, brother of William, possibly arrived in Scituate @1638. Thomas was not listed with those able to bear arms in Scituate, 1643. Timothy Hatherly, “father of Scituate,” described as a felt maker, was baptized at Winkleigh, Devonshire. As one of the Merchant Adventurers who financed the Pilgrims, he made several trips to New England before settling permanently in Scituate by 1634. Hatherly arrived in Plymouth on the ship William by 22 Feb 1632 “to set up a fishing in Scituate” according to notes of John Winthrop of the Bay Colony. He acquired a large tract of land (Conihasset Grant) north of the brook at the harbor which he sold in shares to twenty-six partners by deed dated 1 Dec 1646 (PLCR 1:158). After 1641 he married Lydia Tilden, widow of Nathaniel. John Heliere owned land on Third Cliff by 1635. John Hewes, Huses or Hughes built the eighth house in Scituate by September, 1634. On Kent Street, it was on the second lot south of Meetinghouse Lane. Thomas Hiland/Hyland, from Kent, England, was a freeman in 1638; his house lot was on Kent Street near the Driftway; he also owned farm land on Fourth Cliff. His son Thomas married Elizabeth Stockbridge, daughter of John and Ann____ Stockbridge. Samuel Hinckley, from Kent, England, was a freeman in 1636/7. On 12 June 1635 he was granted a lot on Kent Street, the second south of Greenfield Lane. It was bounded on the south by Nathaniel Tilden’s lot. Hinckley was in Barnstable by 1640. He, his wife Sarah and four children, one of whom was Thomas who later served as governor of the Plymouth Colony until its merger with Massachusetts, as well as a “kinswoman,” Elizabeth Hinckley, were on the ship Hercules with Nathaniel Tilden, 1634/5. William Holmes was a servant of William Hatch and traveled with the Tilden group from Sandwich, Kent on the ship Hercules in 1634/5. According to the Lothropp notes he built the 46th house. He also owned land east of the “King’s Hieway,” near that of William Betts, William Perie/Perry and Robert Shelly/Shelley. Simon or Simeon Hoyte/Hoyt/Haite, of Somersetshire, was listed as a fence viewer in Dorchester, Massachusetts Bay Colony; Simon and his wife joined the church in Scituate 19 April 1635. His house lot was on Kent Street, south of Greenfield Lane. The Lothropp records list it as house #16. Hoyt later moved to Connecticut. Samuel Jackson was in Scituate by 25 Mar 1638 when his daughter Anna “who was born two or three years before” was baptized by Rev. John Lothropp. Samuel and Hester Sealis, daughter of Richard Sealis, were married in Scituate 20 Nov 1639. Jackson was listed as a freeman in Barnstable, 1641. The family returned to Scituate by 1647. Edward Jenkins, servant of Nathaniel Tilden, came with him on the ship Hercules in March 1634/5. He lived at the harbor where he later received a license for an ordinary. Jenkins married Lettice (Hanford) Foster, widow of Edward Foster and niece of Timothy Hatherly. George Kendrick/Kennerick, planter, freeman, 1635. On 6 Jan 1635 he was granted a five acre lot on Third Cliff, bounded on the south by John Hanmer, on the north by William Dauckings. 6 Sept 1636 he was granted a five acre parcel, the second lot on the south side of the drift way adjoining to the south side of Nathaniel Tilden’s lot, bounded on the east by the highway called Kent Street, Daniel Standlake’s lot on the south and Isaac Stedman’s lot on the north. Thomas King from Essex, England traveled to Scituate with William Vassall, 1635; he was appointed elder of the second church (South Scituate) 1642/3; his house lot was at Belle House Neck near Mr. Vassall’s; he also owned land at Rotten Marsh. Thomas Lapham died before 1650. He was a servant to Nathaniel Tilden and arrived in Scituate in 1634/5 on the ship Hercules from Sandwich, Kent. He married Mary Tilden, Nathaniel’s daughter. Jarvis Large, servant to “Goody” Hinckley. Died early - buried in Scituate 9 Aug 1636. George Lewis /Lewes, clothier, of Staplehurst, Kent, was a freeman in 1636. On 10 April 1635 he was granted a four acre house lot on Kent Street, the first south of Meetinghouse Lane. Removed to Barnstable, 1639. John Lewis/Lewes, butcher and innkeeper of Tenterden, Kent and a freeman of Scituate by 1637, was on the ship Hercules with the Tilden group. On the 20th of June, 1635 he was granted the fourth lot on the south side of the drift way adjoining the south side of Nathaniel Tilden’s lot. It was bounded by Daniel Standlake on the north and George Lewis’s lot on the south. “One Linckes” - Lothropp noted that he was “slain by a bow of a tree in ye cutting downe of the tree, March 6, and buryed in the way by John Emmersonn’s House neere Goodman [John] Stockbridge.” He was buried 10 Mar 1637. John Emerson and John Stockbridge owned adjoining land on Third Cliff. Robert Linnet/Linnell was the brother-in-law by marriage to Rev. John Lothropp. He and his second wife Peninah (House/Howes) Linnell were in Scituate by 1638. Prior to their marriage they were members of Lothropp’s Southwark congregation in England and were part of the group which removed to Barnstable, 1639. Barnard Lombard/Lumbard was born in Dorset, England and was one of the early settlers of Dorchester in the Massachusetts Bay Colony. He joined the Scituate church 19 April 1635; was appointed a freeman, 1636/7. His house is listed in the Lothropp records as the fourteenth, built before October, 1636. It was on a four acre lot located on the Green Field, bounded on the north by Samuel Fuller, Hoyt’s lot on the south, with a highway crossing the lot. Lombard removed to Barnstable, 1639. Rev. John Lothropp/Lothrop or Lathrop, pastor of the First Church in Scituate, was baptized in Etton, Yorkshire. Originally an Anglican priest who became the pastor of Henry Jacob’s Independent Congregation in Southwark, Surrey, he was banished from England after being released from jail in London and arrived in Scituate with some of his children 27 September 1634. Lothropp’s house at the harbor, built by October, 1636, was the tenth built in Scituate; he sold it to Richard Sealis in 1640. Lothropp was also granted other land which included a farm on the Driftway where he probably built the fifty-first house by September 26, 1637, as recorded in his notes. He and his family removed to Barnstable, arriving there 20 Oct 1639. Henry Merritt, planter, was in Scituate before 1639. His house lot was on the Driftway. Thomas Pinchin/Pincin was chosen as an arbitrator in a difference about a “parcell of fence” lying on Third Cliff. A descendant later owned land in the Maple Street area on the hill which bears the family name. Abraham Preble, from Kent, England, was in Scituate before 1639 as he witnessed a deed from John Emerson to Nathaniel Tilden dated 10 Oct of that year. (PCLR 1:103) Preble married Judith Tilden, daughter of Nathaniel. Moved to Georgiana (York) Maine around 1642. Thomas Prior/Pryor was buried in Scituate 22 Jun 1639. His will dated 21 June 1639 was witnessed by John Winter, Joseph Tilden, William Crocker and George Kennerick. Two sons of Thomas, John and Daniel, both baptized in Hertfordshire, were in Scituate by 1635, having sailed on the ship Hopewell 11 Sept 1635. In that year John was 15, Daniel, 13. Daniel was in Barnstable by 1641. Isaac Robinson, son of John Robinson, pastor of the Mayflower Pilgrims, was born in Leiden, Holland. He was a freeman by 1636 and removed to Barnstable, 1639. After 27 Jun 1636 he and Margaret Hanford, niece of Timothy Hatherly, were married in Scituate. Robinson was granted property on the south side of The Driftway. Henry Rowlee/Rowley moved from Plymouth to Scituate in 1633; listed as a freeman by 1634. Rowley was allotted the third lot on the south side of the stony (Satuit) brook where his house was the fifth built as recorded by Lothropp. It was bounded on the north by William Gilson, south by Humphrey Turner. Rowley married Mrs. Ann Blossom, widow of Thomas Blossom and mother of Elizabeth and Thomas Blossom. She was among those dismissed from the church at Plymouth in 1634. The Rowleys removed to Barnstable, 1639. Richard Sealis/Sillis was a freeman, 1636/7. and a resident of Scituate by 15 Dec 1637, when he married Eglin Hanford/Handford, sister of Timothy Hatherly. By deed dated 28 Dec 1640 Rev. John Lothropp sold Sealis his five acre lot north of the brook where Lothropp’s dwelling house and “one outhouse thereto belonging,” were located; bounded on the north by Eglin Hanford, on the south by Thomas Ensign, east with the common foot path from the stony (Satuit) brook to the Harbor’s mouth. (PCLR 1:71) According to the Lothropp records, he had also acquired the thirty-eighth house built by Edward Fitzrandolph before 1639. Robert Shelley and his wife Judith Garnett from Boston were married by Mr. Hatherly in Scituate, 26 Sep 1636. He built the 39th house between 1636 and 1637 and removed to Barnstable in 1639. “The Smith’s” are entered in the Lothropp records as building a house before October, 1636; identified by Rev. Lothropp as “Goodman Haits brother.” As noted in Anderson’s “The Great Migration,” Lothropp may have been referring to an occupation and not a specific family. Isack Stedman was in Scituate by 1636 when he built the twenty-sixth house; he owned land in the vicinity of First Herring Brook next to that of Edward Foster’s, later George Russell’s. Stedman and his wife were covenanted members of the church who remained in Scituate after the Lothropp group left; they later removed to Boston. Robert Stetson/Studson appears to have been a resident of Scituate by 1639 as the birth of his son Joseph is recorded in the Town’s vital records in June of that year. John Stockbridge, wheelwright, possibly of Essex, England, his wife Ann and son Charles, age 1, were passengers with William Vassall on the ship Blessing which arrived in New England in July, 1635. He bought part of the mill at Greenbush, had land on Third Cliff and later was one of the Conihassett Partners. Lothropp lists him as building the twenty-fifth house in 1636. Nathaniel Tilden, gentleman, of Tenterden, Kent, came to New England with his wife Lydia, seven children and seven servants on the ship Hercules in March, 1634/5. Lothropp recorded that Mr. Tilden had built the 20th house by October 1636. Tilden was appointed ruling elder of the First Church in Scituate, 1635; died before 6 Sept 1641, when his will was presented for probate. His widow Lydia married Timothy Hatherly. Sarah Tinker/Tynkler was one of the members of the church who remained in Scituate after the Lothropp group left. Humphrey Turner, tanner, possibly born in Essex, England, was allotted the fourth house lot south of the stony (Satuit) brook where he built the sixth house constructed in Scituate; he also had a farm on the Driftway near the Colman Hills. Turner was one of the seventeen organizers of the church in Scituate under Mr. Lothropp, 1634/5. John Twisden was a freeman by 1639. He purchased Isaac Robinson’s farm southeast of the Colman Hills; moved to Georgiana (York, Maine) around 1645. William Vassall of Stepney, Middlesex, England, merchant, age 42, was a passenger on the ship Blessing which arrived in New England by July, 1635. A few of the other passengers were Thomas King, age 21, Jo: Stockbridge, age 27, Ann Stockbridge, age 21 and Sara Tynkler, age 15. Vassall was granted 150 acres on Belle House Neck by the Plymouth Colony Court in 1638 and was one of the founders of the second church (South Scituate); he died at Barbados in 1655. The Lothrop records note that he was the first person to join the Scituate church “in our new meeting house, Nov 28, 1636.” Vassall’s daughter Judith Vassall, age 16, was also a passenger on the Blessing. She married Resolved White and was one of the original members of the second church (South Scituate). Stephen Vinal, possibly from Kent, England, appears to have been in Scituate around 1636/7 when, according to the Lothropp notes, “Goodman” Vinal acquired the house built by Henry Cobb. Stephen was proposed as a freeman, 1638/39 and possibly died around that time as no one by this name is shown on the 1643 ATBA list of men from Scituate between the ages of sixteen and sixty. Anna (nee Vridge?) Vinal was possibly his wife. Records of St. George’s Church. Benenden, Kent, include the baptisms of Martha, daughter of Stephen Vyneall, 10 Aug 1627, and Steven, son of Steven Vynall 28 Nov 1630. and John Vinall, son of Stephen baptized in the neighbouring parish of Biddenden 30 Mar 1634. Nicholas Wade, in later years a tavern keeper, was in Scituate by 1638 when he took the oath of fidelity. He married Elizabeth Hanford, niece of Timothy Hatherly. Isack Wells took the oath of fidelity in Scituate Feb 1, 1638/9; he was in Barnstable by 1639. John Whiston was a servant to Timothy Hatherly. He married Susanna Hanford, Timothy Hatherly’s niece. Gowin White, servant to Timothy Hatherly, and Elizabeth Ward (she may have been a ward of Timothy Hatherly) were married in Scituate by Mr. Ginnings (Jenkins) 15 Oct 1638; their house lot was at the harbor, the fifth north of the stony (Satuit) brook. George Willerd/Willard took the oath of fidelity, 1638; he was punished in 1641 for protesting against paying rates for religious purposes. John Williams was listed as a freeman in Scituate by 1639 but his name is not included in the list of house builders as recorded by Lothropp from 1634 to Oct 1639. Williams and his son John Williams, Jr. were possibly “squatters” who farmed at Cedar Point which was part of Timothy Hatherly’s Conihasset Grant. Richard Wills/Willes of Plymouth, bought the house and land of George Lewis, 1639/40. William Wills/Willes was married in Plymouth on the 4th or 5th day of Sept 1638 to Luce (___) as listed by John Lothropp in his Scituate records. Wills bought what was then called “Long or Tongue Island” in the North River from John Cooper in 1639. (PCLR 1:96) The island is now known as Wills Island. John Winchester of Hingham, Massachusetts Bay Colony, and Hannah Syllice/Sealis, daughter of Richard Sealis, were married in Scituate 15 Oct 1638 by “Maister Ginings” (Jenkins). Winchester does not seem to have owned land in Scituate - he and his family later moved to Muddy River (Brookline) in the Bay Colony. Christopher Winter, planter from Somerset, England, was in Scituate by 1638. He owned land on Third Cliff purchased from George Bower which he sold in 1640 to John Whitcombe. (PCLR I:58) He also purchased twenty acres on the north side of Second Cliff from Thomas Tart who bought it from Anthony Annable. John Winter, born in Somerset, England, possibly a brother of Christopher Winter was in Scituate by 1638. He owned land near First Herring Brook which he sold to Humphrey Johnson before 1650. Walter Woodworth was in Scituate by 20 Feb 1634 as he was named as an abutter in a grant of land to Anthony Annable at First Herring Brook. On 10 Oct 1634 a four acre lot, the third lot on the south side of Meeting House Lane, was allotted to him. Bangs, Jeremy Dupertuis. “The Seventeenth Century Town Records of Scituate Massachusetts” 3 Vols. NEHGS. Boston. 1997-2001. Deane, Samuel. “History of Scituate, Massachusetts from Its First Settlement to 1831.” J. Loring, Boston. 1831. McConnell. Dan R. “The Roots of the Ancient Congregational Church in London, Scituate, and Barnstable, Rev. John Lothropp, Minister” Cape Cod Genealogical Society Bulletin, Fall 2008. New England Historic and Genealogical Society. Vital Records of Massachusetts to the Year 1850. New England Historical and Genealogical Register "Abstracts of the Earliest Wills in the Probate Office, Plymouth," Vol. 4, 1850, 33-36,173-174,280-284,319-320; Vol. 5, 1851, 259-262,335-338,385-388; Vol.6, 1852, 93-96, 185-188. New England Historical and Genealogical Register “The Sutton Family” Vol. 91, 1937, pp 61-68 Pulsifer, David, Ed. Press of William White. Boston. 1861 Shurtleff, Nathaniel B., Ed. “Records of the Colony of New Plymouth in New England, Court Orders. Vol. I.” Press of William White. Boston. 1855.